LED's | General Highway Products, Inc. Demanding traffic signal applications require constant reliability 24 hours a day, 365 days a year. Replacing incandescent signals with high-efficiency, long-life LED systems dramatically decreases energy consumption and maintenance costs. 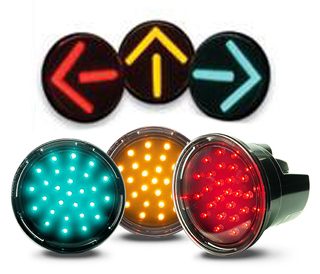 Keyed to various industry or country-specific standards, our complete line of LED traffic signal balls, arrows and pedestrian signals are designed for both OEM and retrofit applications. Bring an element of beauty, with safety and energy efficiency, to your streets with GE LED traffic signals.